The next jewellery making workshop to be held at Resonate Arts House in Alloa is on Sat 31st March. I'm excited about the arrival of Spring (warmer weather, lighter nights, everything coming back to life...) So this workshop has a Spring time theme! Using wire wrapping techniques we will be creating "flower" pendants (pictured below) So versatile and wearable, I love this design! 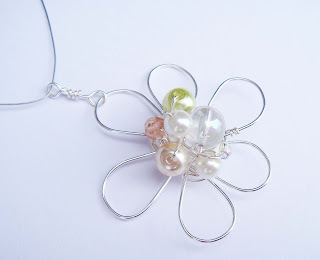 The workshop to create the pendant pictured above is Saturday 31st March, 10am till 12noon, cost £20. All tools and materials are supplied, you will create a beautiful flower pendant to take home with you.